Arnica, Ars., Bell., Calcarea, Ferrum, Ipecac., Lachesis, Merc., Puls., Verat,, Capsicum, Carbo Veg., China, Natrum Mur., Sepia and Sulphur—help to rid the system of Quinine. Other remedies with their indications are as follows: —Ipecac. 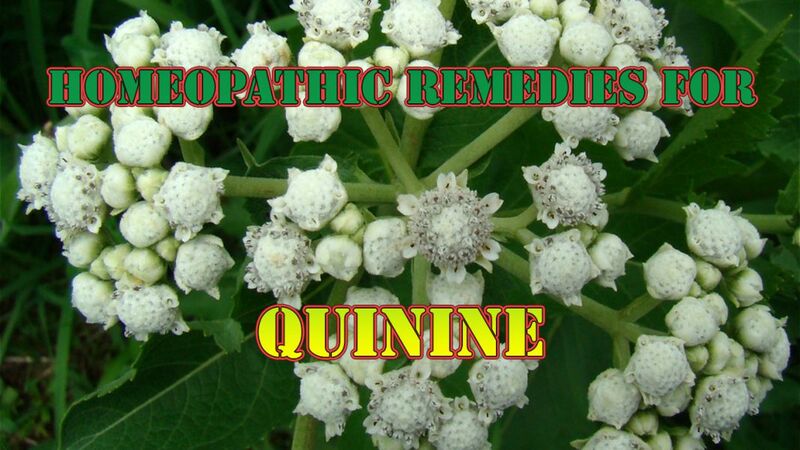 It is the chief remedy to combat the evils of quinine. After it comes Pulsatilla whose indications are After suppression of fever, tooth-ache, ear-ache, headache or pain in the limbs occur. Arnica Rheumatism, feeling of out-of-sorts, sensation of weight and pain in the limbs— aggravated by movements, by speaking or by sounds. Arsenic: Sore in limbs, swelling of feet, dry cough, difficulty of breathing. Belladonna: Congestion of head, face hot, pain in gum, head and face, Bell. is useful when jaundice persists after use of Mercury. Calcarea: Headache, ear-ache, toothache, aches all over the body ; fever is suppressed ; it has been tried after Puls but in vain. Cedron In buzzing of the ears after taking quinine or cinchona. Eucalyptus Headache, buzzing in the ears, malaise like that at the commencement of influenza or an attack of cold. Ferrum: Dropsy of feet. Pulsatilla: Ear-ache; tooth-ache, headache; pain in limbs after the fever is suppressed. Lachesis: Where fever is suppressed or Pulsatilla is ineffective. Mercurius In diseases of liver or spleen. Natrum Mur. Hiccough follows after use of quinine; fever has been suppressed by quinine. Veratrum: Cold sweat and cold body: constipation or diarrhoea. If fever is totally suppressed by quinine Arnica, Ars., Bell., Calc., Carbo Veg., Cina, Ferrum, Ipecac, Lachesis, Merc., Puls., Sulphur. If fever persists after administration of quinine, give at first Ipecac thereafter Ars., Carbo Veg., Lachesis, Puls., Arnica, Cina, Verat., Calc., Merc., Bell., Sulphur. (Use these in their 3-30 potency).